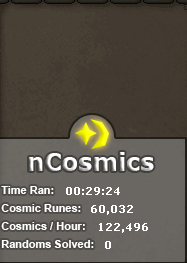 I made a script that makes cosmic runes, as all of the functional runecrafting scripts are for nature runes. Start in Cosmic Rune rift with essence in the first slot on your bank. If you have any problems or proggies be more than welcome to comment. Is this actually good money? By the way, gratz on the release. No there isn't, there's something wrong with your ability to compile and use the script. I'd be interested to see where your evidence is though. This is working a dream for me, I'm on bad internet typically 80ping on most things alas I'm getting impressive results.